Finding and securing a consistent bedtime is one place where a secret recipe may really work. Actually, it's not secret at all. Getting your kids to bed at a consistent time each night has been proven to make them nicer, calmer, more able to focus and better able to pay attention at school. Overall, this consistency reduces many potential behavior problems. 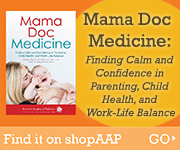 Pediatrician Wendy Sue Swanson, MD, FAAP, author of "Mama Doc Medicine," joins Melanie Cole on the Healthy Children show with advice for parents on creating a consistent bedtime routine.